Spring time is naturally a very cleansing time of year. After a long, cold winter of heartier, heavier foods, Spring rolls in with its fresh, light flavors that are designed by nature to help clean us out and lighten us up a bit! Leafy greens are the number one ingredient missing in the American diet which is why I’ve decided to focus on Spring Leafy Greens this month! 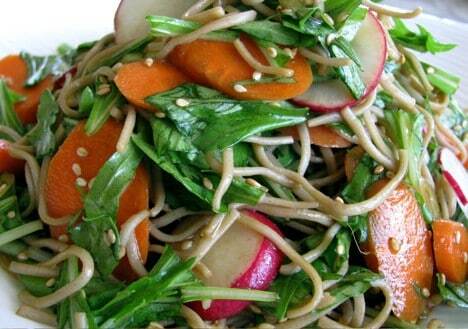 I’ll be posting the “Spring Leafy Greens ‘101’” in a couple of days but in the mean time I wanted to share this recipe for Soba Noodle Salad with Mizuna. Mizuna is a leafy green which I’ve read about before but never cooked with because I never saw it anywhere SO when I saw it at the Farmers Market last week I really wanted to give it a try. It was really great… very light and crisp, pretty mild with just a little bite to it. Check out this link for a more detailed description because my brain it is jet lag mode right now (I just flew back from a week in Jersey) and I’m not really thinking straight;). I will say this, if you can’t find Mizuna you could easily substitute watercress in this recipe and be a very happy camper. Also, if you don’t have or can’t find any soba noodles, go ahead and swap out some whole grain spaghetti! If you have the noodles cooked up already this meal comes together in literally ten minutes, so it’s definitely falls under the “SUPER SIMPLE” category:). Oh and I almost forgot, if you wanted to take this meal one step further try adding some shredded or chopped chicken over the top… it makes a great addition! 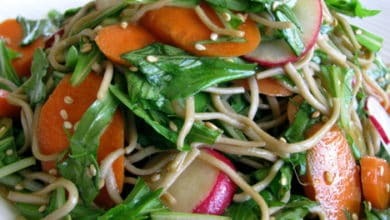 Combine Mizuna, carrots, scallions and noodles in a large bowl. In a separate bowl, combine garlic, ginger, oil, and soy sauce. Whisk together and pour over noodles. This looks yummy, but sadly, I live in a very, very rural area that has neither mizuna nor watercress. Any other suggestions? Would any leafy greens work? Megan – Can you get your hands on some arugula? I think arugula would be a great substitution as well. This looks great! I just bought some soba noodles, but didn’t have a plan for them.. until now. What about baby spinach? It seems like that might work in this dish, no? Anticiplate – I LOVE dandelion greens too! My QuickBite this month is actually a recipe using dandelion greens but that won’t be posted for a few more weeks, so don’t tell anyone I told you;). As for the Mizuna, it really isn’t very bitter at all, it’s a very tender, thin, crisp leaf. It’s almost like a baby dandelion green. If you can find some,you should definitely give it a try and let me know your thoughts! Amanda – Absolutely!! Great suggestion, baby spinach would definitely work. Any tender green that can be enjoyed raw would do the job. This looks amazing! I think I will have to make this tonight – I was actually looking to whip up something for tonight as dinner and use leftover for lunch tomorrow – this will be great! I’m going to Whole Foods at lunch to pick up the items. I love love love sesame noodles. I’ll have to keep an eye out for mizuna, although I might also thrown in some of my new favorite obsession: pea shoots. Winnie – Oh, if you only knew how happy it makes me to know that people actually try my recipes:). I hope you enjoy it! Michelle – I bet pea shoots would be great… that’s a good idea:). Thanks, Dani. Will try arugula or baby spinach! That soba noodle salad looks good. I will have to look for some Mizuna.